Pearl Drops Instant Natural White for daily use, contains Activated Charcoal, that gives you the confidence boost of visibly whiter teeth instantly and daily gradual whitening, naturally. This minty purple paste contains Activated Charcoal, a natural ingredient with a long history of detoxing and cleansing benefits. 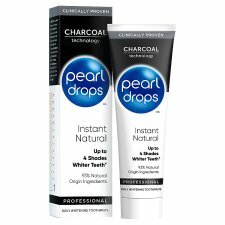 The formula helps to draw out the impurities on your teeth and in your mouth to protect against stains and gently whiten as you brush. It also contains optical brighteners for a brighter, glossier smile in an instant. The combined action of Fluoride and Plaque Removers strengthen and care for your enamel with everyday brushing. Specialist Teeth Whitening for Over 40 Years. Teeth will look instantly whiter after one use. 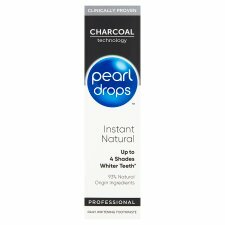 Get long lasting whiter and healthier teeth with everyday use. Not suitable for children under 7. 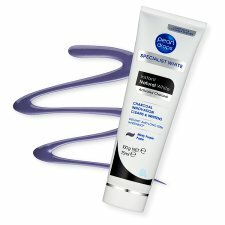 The purple colour from the paste may have temporary staining effect on hands and mouth. Suitable for natural teeth only.